The largest of the Cayman Islands shell companies - called Service Employees International Inc., which is now listed as having more than 20,000 workers in Iraq, according to KBR - was created two years before Cheney became Halliburton's chief executive. But a second Cayman Islands company called Overseas Administrative Services, which now is listed as the employer of 1,020 mostly managerial workers in Iraq, was established two months after Cheney's appointment. In one previously unreported case, a group of Service Employees International workers accused KBR of knowingly exposing them to cancer-causing chemicals at an Iraqi water treatment plant. Under the Defense Base Act of 1941, a federal workers compensation law, employers working with the military have immunity in most cases from such employee lawsuits. Service Employees International was set up in 1993, as Brown & Root was ramping up its roster of overseas workers. Two years later, the company set up Overseas Administrative Services, which serves more senior workers and provides a pension plan. 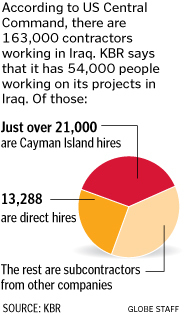 KBR is now widely believed to be the largest private employer of foreigners in Iraq, and it hires twice as many workers through its Cayman Island subsidiaries as it does by direct hires. Service Employees International alone employs more than 20,000 truck drivers, electricians, accountants, and engineers, roughly half of whom are American, according to Browne, the KBR spokeswoman. To the people listed as its workers, Service Employees International Inc. - known to them as SEII - remains something of a mystery. The real managers of Service Employees International work out of KBR's office in Dubai. KBR and Halliburton, which also moved to Dubai, severed ties last year. Both KBR and the US military appear to regard Service Employees International and KBR interchangeably, except for tax purposes. According to the Defense Contract Auditing Agency, KBR bills the Service Employees workers as "direct labor costs," and charges almost the same amount for them as for direct hires. The contract that workers sign in Houston before traveling to Iraq commits workers to abide by KBR's code of ethics and dispute-resolution mechanisms but states that the agreement is with Service Employees International. Some workers said they were told that Service Employees International was just KBR's payroll company. Others mistook the name as a reference to the well-known, large union, Service Employees International. David Boiles, a truck driver in Iraq from 2004 to 2006, said that he realized he was working for Service Employees International when he arrived in Iraq and his foreman told him he was not a KBR employee, despite the fact that his military-issued identification card said "KBR." Correction: Because of conflicting information on official documents, a Page One story about the federal contractor KBR's use of shell companies in the Cayman Islands misstated the name of one of the companies. It is Service Employees International Inc. When Texas pipe-fitter Danny Langford applied for unemployment compensation after being let go by Service Employers International Inc., he was rejected, he was told, because he worked for a foreign company.